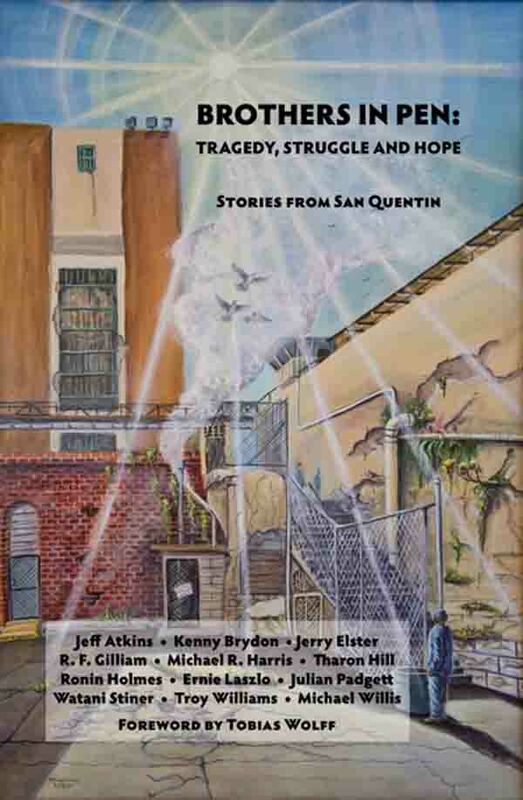 A new anthology of fiction and creative non-fiction written in an ongoing writing workshop at San Quentin State Prison by twelve men, mostly Lifers, all serious writers, is now available. A strong theme emerging from this collection is the nature of violence and its effects on human beings, and the kind of struggle required to turn violence around. The subtitle of this anthology, “Tragedy, Struggle, and Hope,” speaks to this vision. However, the seriousness of the subject matter doesn’t mean these stories are all heavy and harsh. There is much humor, wisdom, complexity and hope to be found in these pages. You’ll encounter struggles of temptation and forgiveness, soul-searching inquiries into the past, tragic love stories, battle bots, psychogenic amnesia, first-person accounts of Black Power history, prehistoric family drama, gang cease-fires, tommyknockers, and much more. The class had the honor of Tobias Wolff visiting and contributing a foreword for this book. “We are storytelling animals,” he writes, and this anthology is evidence of his words. All proceeds from the sale of this book go through the William James Association to support this creative writing class through the Arts-in-Corrections program.